Often SMEs need a wide-range and accurate support in innovation, technology transfer and partnership collaboration. You are looking for large-scale knowledge and research expertise from universities and R&D institutes? HYPEREGIO BuSyBee is the right solution for you! The cooperating universities, research centers, clusters and associated partners are able to initiate a suitable Science-to-Business (S2B) partnership taking your development to an increased TRL (2-5), leading e.g. from proof of concept to laboratory prototypes. Join our S2B and technology oriented crossborder events. Contact our managers to help you to establish multilateral cross-border R&D consortium. Advance the technical progress of your research results or prototype thanks to dedicated European S2B funding sources. 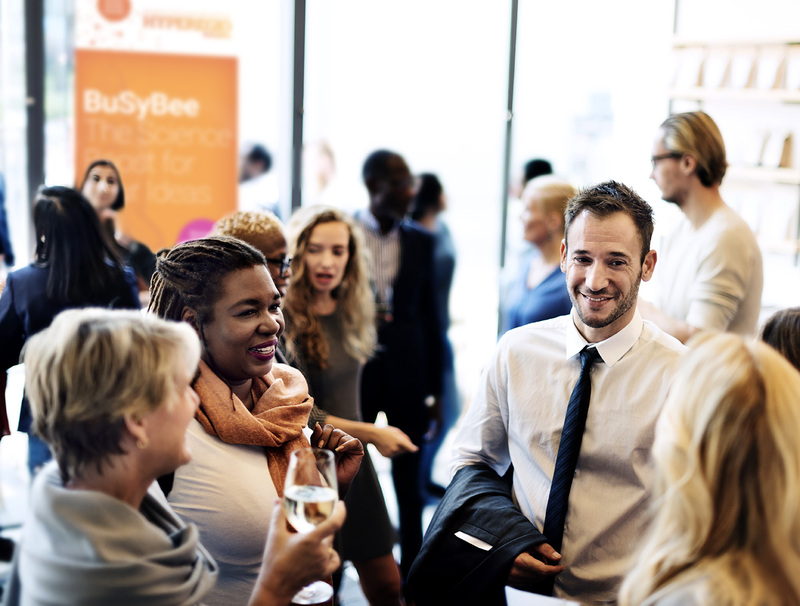 Get connected… to the right partners, by using our BSB MANAGERS network. Are you aware of the excellent research and technology level we have across the borders? Do you have a technology related problem, and are you looking for answers? You don’t know where to look for the right expert? Ask our BSB managers! They provide and arrange appropriate contacts and support you in building efficient cooperation with universities, labs and research centers. Meet… the right partners, by attending the appropriate EVENT. You want to get in contact with the right partners across the borders and find your perfect match? Then participate in our events! Each one focusses to a dedicated topic where you meet top researchers, decision makers and CEOs to start the cooperation you are looking for. HYPEREGIO-BUSYBEE – THE IDEAL SOLUTION FOR YOUR INNOVATIVE AND COMPETETIVE PROJECTS. Allow more innovations to come to the market as new products in order to strengthen the SME companies’s business and to have a direct economical impact within the Euregio Meuse-Rhin area. Enhance the crossborder valorisation of technologies and ideas that are currently waiting in the Universities’ laboratories or in the SMEs. In this regard, the Universities’ Technology Transfer Offices (TTOs) must adapt themselves to the new innovation environment and the context of valorisation, leading more SME companies into the laboratories and bringing innovation to the market thanks to open innovation and crossborder private-public collaborations. Fit in a Triple Helix strategy with Knowledge institutions (KI), industry and governments. Develop/enhance the two-way exchanges between SME companies and KI of the EMR concerning R&D&I, to enhance the innovative strength of SMEs and make them more competitive. Stimulate smart specialisation strategies by bringing more SMEs to the Universities in order to find solutions to their innovation issues via collaborations and co-creations with laboratories. For example, this concern SMEs that needs to adapt their technologies / products to new markets or to new customer requirements. Support a crossborder valorisation of technologies coming from Universities of EMR at a Technology Readiness Level (TRL) of 2-3, through collaboration and co-creation with SME companies and industrial research institutions that will bring these technologies to a much higher TRL (4-5). Support/enhance the innovation ecosystem of EMR+ by strengthening the innovation structure through intensive cooperation between SMEs and KI. Professionalization of TTO, leading to a crossborder TTO network in EMR+. This network will allow an harmonisation of the way to do valorisation in the EMR, a higher visibility of the EMR Universities’ offer to the SME companies and to the other regions. a perfect ground to discuss new visions.